"And afterward I will pour out my Spirit on all people. Your sons and daughters will prophesy, your old men will dream dreams, your young men will see visions. 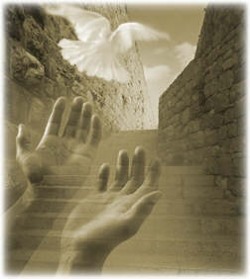 Even on My servants, both men and women, I will pour out my Spirit in those days" (Joel 2:28-29). Joel's prophecy refers to the Lord pouring out His Spirit on all believers. Peter, filled with the Holy Spirit, acknowledged that this prophecy was fulfilled beginning at Pentecost: "This is what was spoken by the prophet Joel: 'In the last days, God says, I will pour out My Spirit on all people" (16-17). At conversion every Christian receives the Holy Spirit. The Holy Spirit bestows spiritual gifts as He sees fit, in order to build up the Body. All do not receive the same gift; nor is any one gift the initial evidence of having received the Spirit: "Now to each one the manifestation of the Spirit is given for the common good. To one there is given through the Spirit the message of wisdom, to another the message of knowledge by means of the same Spirit, to another faith by the same Spirit, to another gifts of healing by that one Spirit, to another miraculous powers, to another prophecy, to another distinguishing between spirits, to another speaking in different kinds of tongues, and to another the interpretation of tongues. All these are the work of one and the same Spirit, and He gives them to each one, just as He determines" (1 Corinthians 12:7-11). The Holy Spirit continues to operate in the life of the believer throughout the sanctification process. Some Christians believe there is an additional baptism in the Holy Spirit available -- one that not all Christians will receive -- that provides additional spiritual power and gifts. Those that take this position cite proof-texts such as Acts 19:6. This is not an issue to break fellowship over, as all Christians will acknowledge that the Holy Spirit indwells all believers. "For we were all baptized by one Spirit into one body -- whether Jews or Greeks, slave or free -- and we were all given the one Spirit to drink" (1 Corinthians 12:12-13).